I’m not certain if you are a football fan, but most Georgians can remember Super Bowl LI played by the Atlanta Falcons against the New England Patriots. It’s the game that seemed to be secured by the Falcons at half-time only for New England to make an amazing 25 point comeback, securing the lead and winning the game 34-28. On this night we learned the all important lesson that it’s not how you start, but how you finish that counts. Maybe, you recall Game 1 of the 2018 NBA finals between the Cleveland Cavaliers and the Golden State Warriors. J.R. Smith, the Cavaliers point guard, secured the rebound with just seconds left in the 4th quarter. However, in a bizarre moment of confusion, instead of scoring to secure the win, he dribbled the ball out to half-court. It was evident that the Cavaliers were disappointed. They did not win in overtime, and were swept in the Finals series. Again, it isn’t how you begin, but how you finish that counts. In our lives, we can see a shocking resemblance. A 2013 Forbes magazine article cited that over 40% of Americans commit to New Year’s Resolutions but only about 8% actually complete them, according to University of Scranton research. Our lives aren’t benefited by what we commit to but by what we complete. In short, whatever we begin, we must commit to finish! On this coming Sunday, the month of July will officially begin and we will stand at the midpoint of the year. We are at the half way mark. Half of the year has gone and yet half awaits us. Though our time is swiftly passing, have we yet reached our goals? Are we any closer to seeing our lives transformed by making the critical adjustments we promised to make when the year began? 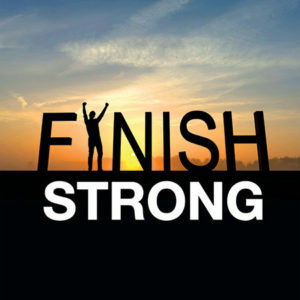 Now is a good time to commit to finish strong! Let’s discuss, in brief, some keys to a strong finish. 1. 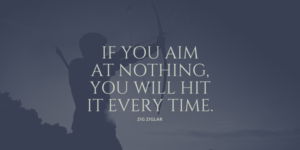 Create goals and record them clearly. In order to see your life change, you have to “see” your life changed! All victories begin with a compelling vision. In order to change, I cannot stop with realizing that change is necessary, I must envision the change needed. I need to prayerfully dream about a better future. You’ll know when you have it. Your heart will exclaim, “that’s a good idea!” But my life will not improve unless that dream becomes a reality. I cannot leave it as a dream, it must become a clearly defined, written goal. What’s the difference in goals and good ideas (dreams)? Goals have a time component that says I must complete this or be nearing completion by this time. A goal without a timeline is only a good idea. We need deadlines to ensure that we work things through in increments toward completion. Write the vision, and make it plain. Whether it’s a promise from God, a plan for a better future, or a personal desire to help you live your life fuller and better, don’t leave it as a dream, think it through until it becomes a clearly defined goal and write it down. In the beginning of a year, we may have identified a myriad of potential changes we want to see. The half-way mark is a great time to synthesize and prioritize. 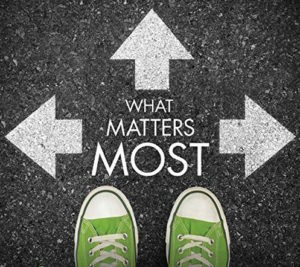 We want to be certain that we invest our energy in what really matters. When I review my goals, the question I want to answer is, “does the outcome substantiate the time necessary to complete?” For example, who could justify spending $100 for a 4 for $4? The value of the meal is $4 and money is hard to come by. You may be unaware, but TIME is the most valuable commodity you have in life. No matter how hard you try, you cannot get more of it. Make certain you invest it where it matters. Spend it on your family, on matters of eternal significance, on enhancements that will better your life in the future. You wouldn’t let someone sell you a $4 meal for $100, therefore, don’t let anything waste your time. PRIORITIZE! 3. Read, Recite, and Run with it! 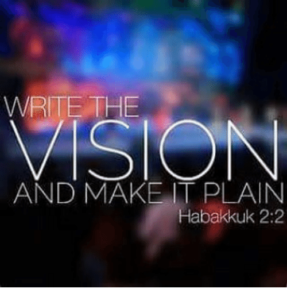 Habakuk tells us the vision has to be written so that it can be read. It must be read in order for us to run with it. You need to record your goals in a place that you can prayerfully read it regularly as a reminder of what God promised you. Reading goals regularly helps us to focus intently on it. It helps us to eliminate distractions by focusing on the desired end goal. Horse trainers understand the power of focus. In competitions, horses wear blinders that keep their vision focused forward and protect their eyes from dirt and mud. Reading and reciting your goal often is important because as you run, inevitably dirt and mud will rise. The dirt of failure, fatigue, and the opinions of others will arise and attempt to get in your eyes, but don’t allow it. Your own voice will say “I’m tired,” or “why aren’t I there yet?” Then the voices of others will join the “Quit Chorus!” Reading, Reciting, and Running is about developing a discipline that says, when I know God wants this for me, I will commit to focus and move forward until I get there. I won’t allow myself to become distracted by what others are doing or saying, I will focus. When you have prayerfully outlined and prioritized your goals, read them often, recite them regularly, and find a way to run with it daily. It is said that the journey of a thousand miles begins with one step. That being said, the journey of a thousand miles ends one step at a time! With each step, you are one step closer to your goal! Therefore, Keep Going!